The Sensor Red - World Class Tone. Lace has built these world famous patented pickups since 1985. Used exclusively by Fender until 1996, these pickups have the same specifications with the same great tone. Red Lace Sensor pickups are designed to duplicate an early Fender single coil pickup. Crisp top end and bell-like tone, the Lace Sensor Red utilizes the latest technology to provide excellent tone for today's players. The Lace Sensor Red single coil pickup has a unique radiant Field Barrier system that surrounds both the coil and magnets, reducing annoying 60-cycle hum. The patented Lace Micro Combs replace traditional bobbins, yielding a wider tonal range and better string balance than traditional pickups. Unlike ordinary pickups, it generates 36 separate magnetic "sensing" fields that, in the areas where they contact the string, "read" the strings' vibration. (Regular pickups for the bridge position only generate anywhere from 4 to 12 fields). 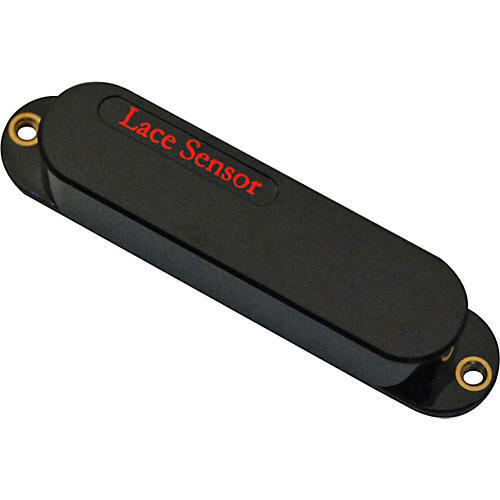 The Lace Sensor Red guitar pickup also has Radiant Field Barriers: metal slides that frame the inner core of the Sensors and perform two functions. The first is to shield the Sensor from the outside noise and 60-cycle hum. The second is to produce broader, yet more concentrated, umbrellas of sensing field than standard magnetic pickups. As compared to standard guitar pickups, the Lace pickup reads a greater physical area of the string, while picking up less outside interference. This makes the signal-to-noise ratio nothing short of phenomenal for a single coil system. Also, a wider range of harmonic content is read by the Sensor, delivering a more complex tonal response. Since it operates so efficiently, Lace Sensors can utilize much lower energy magnets than ordinary pickups, and this in turn brings about a whole new realm of properties. In regular pickups, the magnetic fields are so strong they physically dampen, or drag on, the strings' vibration, reducing sustain and actually changing the pitch. But in the Lace Sensor Red, string dampening is virtually nonexistent. This means your sustain is increased dramatically while the string holds its true pitch for the duration of the note.